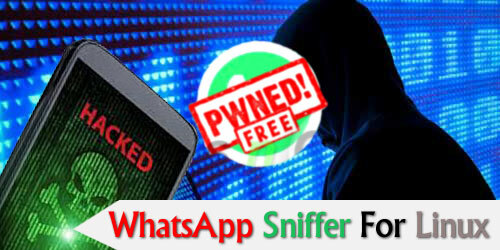 Download WhatsApp Sniffer for Linux and spy on your victim’s WhatsApp account. Yes, this application can break the system of WhatsApp and allows its users to get all the data like messages, videos, images, etc. At the same time, you also will be able to edit their conversations too. That’s why you should download this app. We do not doubt that if you are reading this article and have a Linux PC. You will discover that WhatsApp is supported in the OS. It is because it is one of the most popular apps in the world, one of those essential in your particular case. We can communicate quickly and easily with all of our acquaintances, making us save money. We are always in contact. You can hack WhatsApp conversations from Linux PC by using Linux version of WhatsApp Sniffer. Like any messaging application, WhatsApp is often used for two people to comment on a private issue, or to send information that might interest them to third parties. It is from there that have appeared all kinds of software specially designed to allow us to get into the chats of other users. The WhatsApp Sniffer for Linux is the best spying tool that can hack any user’s WhatsApp account on Linux operating system. In addition to that, this application is the perfect choice for all Linux users as well. That is because they will be able to hack their victim’s WhatsApp account without any problem and with a single click. Now, you must be thinking that what this tool does? Then you will be shocked to know that this Sniffer tool can break the system of WhatsApp and allows users to get other people’s data. With the help of this application, you will be able to get your victim’s WhatsApp messages, photos, and videos too. Moreover, it is easy to use due to its simple interface, and it is free to use. Does Whatsapp Sniffer work in Linux PC? The first thing we should say about the Sniffer app, it is an application that is available for the Android operating system. You must download an android emulator to use WhatsApp sniffer for Linux. Android-x86 is the best emulator for Linux. Sure, many will think that WhatsApp Sniffer is another of those deceptions that exist circling to rip off people who do not have great knowledge of the matter. We must say that not only are many who say that it works. At the same time, you find that it does not keep ads or all the classic problems of these apps as a scam. Of course, it is not always easy to enter the conversations of others. They depend largely on what connections have made those chats. If you want to get that private information, you better do patience. And step by step review all the details of an essential application like WhatsApp Sniffer. To use this application on your Linux, you have to full-fill some criteria. The first one is that you need to have a device that has Linux as the operating system. In the meantime, your device and your victim’s device need to be on the same network. It can be open network or other as well. Moreover, both nodes have to be close. Otherwise, this app is not going to work. The real thing is that although it is true that the Sniffer app can no longer be downloaded directly from the Linux app store. You still have the chance to take it to our Linux PC through Android-x86. How to Use WhatsApp Sniffer for Linux? Moreover, the operation itself of this application is not complicated. All we have to do is to put it to work. And when installed, we will start, and then ask for the permits of Super USER. Which of course we will grant, and the dirty work will be underway. Once running the application will survey all conversations in search of these data or juicy information. It is that you are waiting to find. On the other hand, we do not doubt that you will surely be interested in being able to know how to avoid the chance to be spied on yourself through this very famous instant messaging application. WhatsApp has recently assured that now encrypts all messages. Most security experts do not end up believing too much to their developers. To avoid this type of inconveniences, we strongly recommend that you always try to use secure connections. Such as our data rate, leaving aside those related to Wi-Fi or free access points. Of course, you should not rule out the chance to communicate through an alternative app. You can follow the below steps to use the WhatsApp Sniffer on your Linux device. But, your device has to be rooted try to remember that. You need to download the WhatsApp Sniffer application at first, and you can get it free from here. Now, you have to open this Sniffer tool and provide all the necessary root permissions as well. After that, you have to go to this Sniffer tool’s homepage and select the fellow from there. Then you will be able to spy on your victim’s WhatsApp account without any problem. In short, tt is an application that serves to see WhatsApp conversations of other phones or hack WhatsApp. We believe that this is the best app to spy on WhatsApp data. Download the Android-x86 android emulator in your Linux PC and use Whatsapp sniffer for Linux. the WhatsApp Sniffer for Linux is the best application for hacking WhatsApp on the Linux operating system. With the help of this tool, you will be able to spy on any WhatsApp account and get all the data. Download WhatsApp Sniffer for PC.